Any new treasures? This is my new favorite pennant (from my collection at least). The milky portion of the image is from schmutz on the lens...darn kids. That's a nice one Mike...and one I don't think I've seen before. 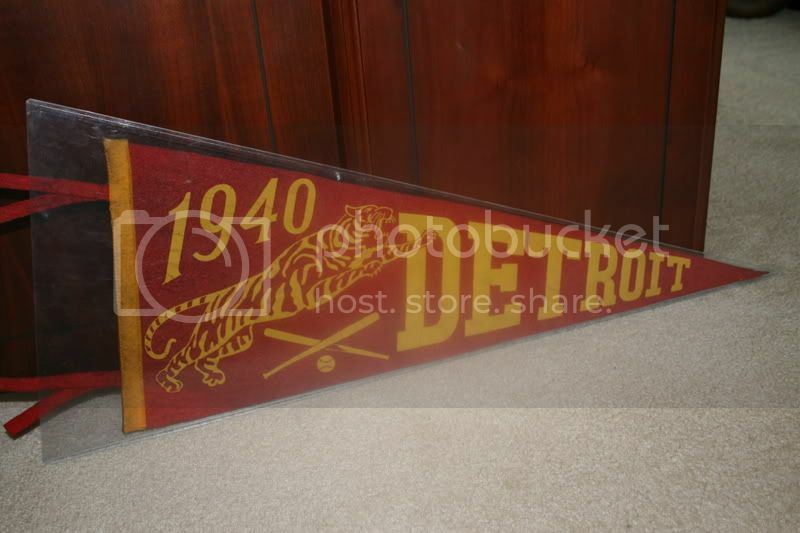 How many different prewar Tigers pennants does that make for you now? This is one I've been waiting patiently for after getting sniped out on the last one. This is only the second poster/handbill I've ever seen for the NI and it is by far the latest. I have found no literature at all on the NI team from the 1930s. Mike, nice pennant. Dan, thanks for sharing your NI items, awesome! I hope to have something to share soon. There aren't a lot of things that I would say I'm an "authority" on, but I've seen a heck of a lot of different Cleveland Indians pennants over the years. I'd never seen this one before this week, so I was thrilled to pick it up on eBay. Not a great photo; it's the one that was in the listing. That makes 4 maybe 5 Dan. Not sure of the date of a couple. They have early characteristics, but who knows for sure unless you see a photo of one that is dated. I am LOVING pennants right now and the Tigers seem to have had a wider variety than most teams. I would say Cleveland is up there options available as well. Does anyone know a collector who is an "authority" on pennants? D. Bushing seems to know almost every niche of memorabilia and has written short articles in MEERS about pennants. 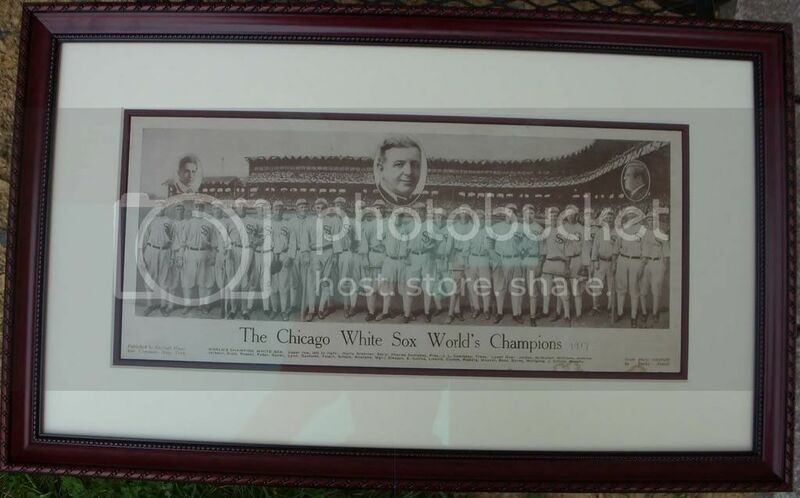 I would give my right arm to see the personal collections of some of the premier pennant collectors. I almost went after that pin Dan. However, I thought (knew)you would appreciate it more than I. Rob, I don't recall seeing that piece before. Are you an Indians pennant collector only? Most of my pennant efforts of late have been Tigers and an occasional Yankees but I also have NY Giants, Cards, W Sox, and a few others. Only one Indian, but it's a common 60s piece. I collect all types of pre-1960 Cleveland Indians memorabilia, but I have a particular fondness for -- in no particular order -- pennants, pencil clips, opening-day ticket stubs and figural display pieces. I rarely pick up pennants anymore because I don't often come across one I don't have, plus there's the space issue of displaying them. I've got 4 1/2 walls of my basement dedicated to Indians pennants, and I don't want to devote any more space to them. When I first started to collect pennants, I would pursure all the color variations for each different style. I quickly came to the conclusion that that wasn't practical, unless I wanted to store a lot of pennants in boxes, which I thought defeats the purpose of collecting in the first place. As it is, the only ones on display are the unusual ones and styles that reflect All-Star Games, World Series or other special events. I really love pennants. Just wish they were easier to ship and display. Rob, how does a fella go about seeing a few photos of your basement walls. I would greatly appreciate a peak at your pennant collection. Check your e-mail. I sent you a link a couple hours ago. Let me know if you didn't get it. I just sent you another e-mail. I didn't get the second either Rob. Did you receive my email? Ah, the beauty of e-mail. I've sent you another, this time from my work e-mail address. Give me a shout when it's received. Piece of Syracuse China (circa early 1960s) used at the Wigwam Room (for media and team officials) at old Cleveland Stadium. Two new ones for display. I just received what may be the single highlight of my collection (and a piece that I've been looking for since I first saw it on the Incurable Collector segment on Bill Mastro way back in 2001) from the recent Sotheby's auction. I'm having a custom shelf built to display it. I also just picked up a long sought-after original Mickey Mantle Hartland tag on E-Bay to add to my Mantle Hartland statue. And lastly, I picked up this terrific 1914 Braves pin on E-Bay (going to get it framed this weekend hopefully). A very busy month for me! My wife would kill me if I had a "busy month" like that Aaron. That trophy is awesome...and the pinback ain't too shabby either. 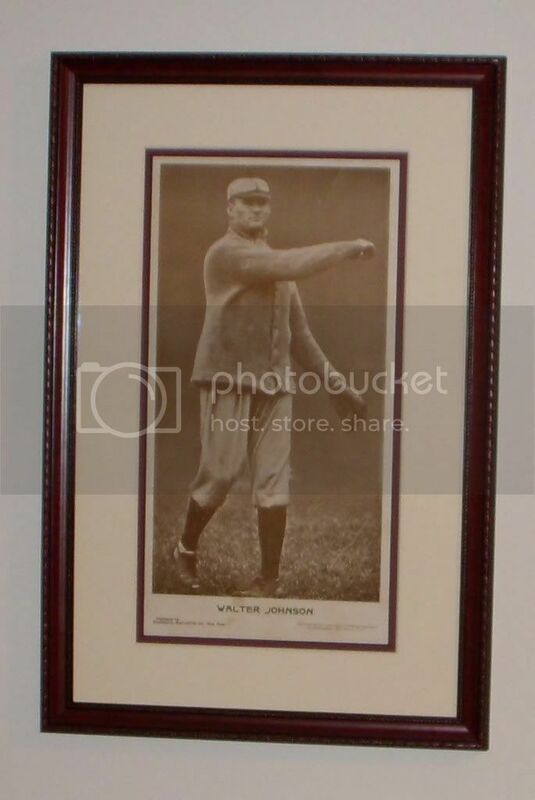 Jim, I've never seen that Walter Johnson premium before, very cool. Aaron, wow that is very unique. Is there a date on it? Hi Clint,I had never seen it before either. It was in an REA (or Mastro) auction last year buried in along with 100 or so other premiums. I knew there was a large premium of WaJo without his shirt and the byline talking about his expensive arm, but I never knew about this one. SO I had to pay dearly to get this premium. But it was worth it. Some of the other large premiums have a numbering system (1 - 7) on the left hand side. I just picked up Matty, Wagner and one other like this. Interesting, the Matty is completely different pose from the other large type Matty I have, while the Wagner is the same pose (but different first name listed) as the non-numbered Wagner. When i get some time, I should post the non-numbered and numbered large type premiums. The Federal League large type premiums are also extremely hard to find. Great stuff though! Aaron, I have admired that trophy for years. It's changed hands a couple times as you noted. It is stunning. Jim, would love to see some more of those premiums if you get a chance. That White Sox one is pretty nice as well. Hi Clint, going on a weekender but will get some more pics out next week (wrote myself a note to remember). Great Pinback of the Royal Rooters Aaron. I had looked at that one. Fortunately for my wallet (there's only fleas in there after the last REA anyway), it's from 1914 and for the Braves and not the Sox. Picked up 18 snapshots of a 1951 game between the Indians and Tigers at Briggs Stadium. P.S. I love that Gibson photo...very nice. I didn't know you could make a scan that small. As for your question I don't believe I've ever seen a mini decal bat with tape on it. I didn't know it could be done either. I'm struggling with this posting scans thing. Back to the drawing board! I've seen a few mini bats with tape on them. They have all been Joe Jackson bats. There was a cork grip mini bat of Babe Ruth sold a few months ago also. That leads me to believe that the bat did, in fact, come with the tape on the handle when it was made. I was thinking that I saw a Jackson bat auctioned by Lelands some time ago that had the tape.